Allegro Appassionata was written for the JACK string quartet in the summer of 2009. Its title refers of course to various emotionally intense pieces of the 19th century, and perhaps to the music of Alban Berg. However, its musical language is hardly "romantic," and sometimes seems to be breaking down as the piece progresses. Much of the passion stems from the stratification of musical processes in which the quartet is broken into opposing ensembles (such as violin I and cello, versus viola, versus violin II playing three different independent continuities). Each ensemble goes its own way so that the overall flow is jumbled or reified--or both--into musical moments of enthusiastic zeal, ardor, or fervor. When only one process is going on, the music becomes focused or momentarily calm, but not for long; ever new arrangements of multiple strata lead forward. In fact, every type of process assembly occurs in the composition including solos where each instrument has its day: after the opening flourish of four independently evolving musics, the viola plays an intense solo marked by outbursts; a solo for the second violin soon follows, including pizzicato glissandi; nearer to the end of the piece, a violin duet segues into a solo for violin I, slightly similar to the viola's, but higher and more imperious; the work ends with a cello solo that refuses to give up and end the piece in resolution. 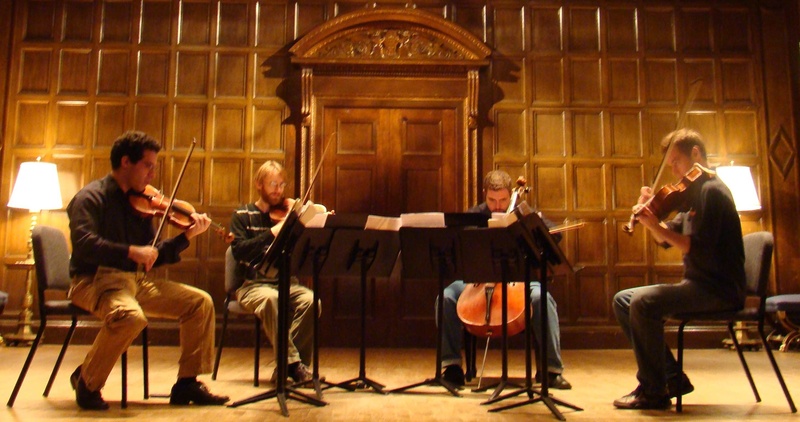 Despite the work's intensity--or rather, undergirding the intensity--each process has its own harmonic coherence that suggests connections with other 20th-century string quartets, most notably, Elliott Carter's second quartet.